Pride of ownership is apparent in this model perfect home. This 2 bedroom/2 bath great room open plan layout also provides a DEN for watching tv, craft room, office, library or an extra room for guests. Home has been updated to perfection. Painted inside and out, newer floor coverings throughout, newer HVAC, rescreened lanai with awning, master motor for spa, washer and dryer, custom window coverings and plantation shutters just to name a few. Lets not forget that both bathrooms have been updated as well with wooden vanities and granite counter tops. Whole home speaker system is controlled by the electronic system that stays with property. After a day of golf or tennis, relax on the oversized lanai with custom painted artistry, a dry bar, partial golf course views, and a propane heated spa. Or take a dip in the community pool which is next door to this home. 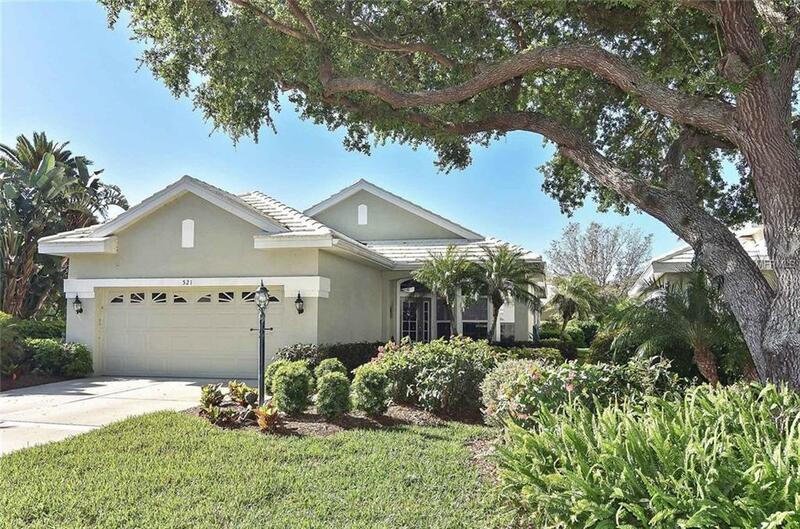 Wentworth is a maintenance free community of 55 homeowners within the master association of The Venice Golf and Country Club and is located near the rear exit/entrance to the community. VG&CC offers 18 holes of golf, Har Tru tennis courts, fitness center, a gorgeous clubhouse, social activities, restaurant, resort style pool and so much more. There is a one-time $10,000 initiation fee to join this member owned Club. All residents are required to join the Golf or Club Plan. There is off-site storage for your larger toys (RVs and boat trailers.) No CDD fees.